UMD and Michigan Tech will play for the 224th and 225th times this weekend. 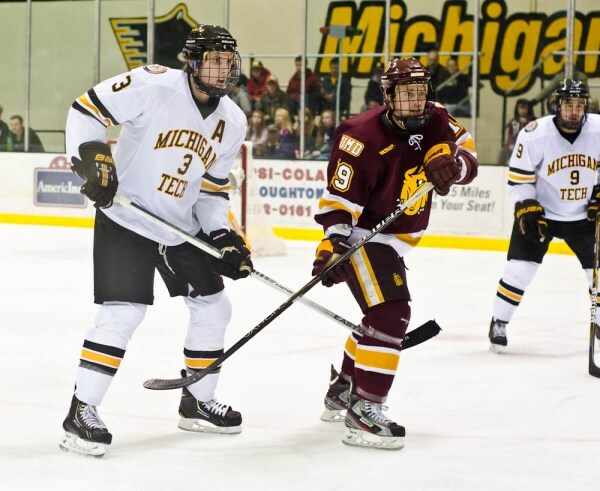 The games no longer count towards the conference standings, but the series between UMD and Michigan Tech is still significant. Not only will the Bulldogs be playing for the ever-important PairWise advantage, but also the chance to measure itself in games that count. Despite the successes in the exhibition thumping of Lakehead University, there is obviously much to learn about this edition of the Bulldogs. The concerns at the blue line and in goal still remain, and it will be interesting to see how the entire team performs during what’s sure to be a grind-it-out, physical series. How to follow: Both games will be on My9 in the Northland and live stream will be available on americaonesports.com. If radio is your thing, 94x has the game locally and you can listen online at 94xrocks.com. year. Herbert’s back-to-back 19-assist seasons show he’s willing to distribute the puck, but he’ll need to boost his goal production back to what it was in his freshman season (14) or more. While he’s not a flashy player from the backend, Derik Johnson should be given every opportunity to be an everyday player this season. He has all the tools — skates well, plays the physical game, has good hockey sense — and could develop into a mainstay on the Bulldog blue line with a strong start to the 2013-14 campaign. For the Huskies, forwards Ryan Furne, Alex Petan and Blake Pietila are crafty, dynamic forwards. Furne has enjoyed tremendous success against UMD in his career (11 points), while Petan was Tech’s leading scorer last season and Pietila ranked second in goals (14) while proving he is a consistent two-way forward. Shutting down these three — or at least limiting them — will drastically increase UMD’s chances at a pair of wins. By the numbers: UMD is 10-1-2 in the last 13 contests between these two teams, including a 3-0-1 mark last winter … UMD has played Michigan Tech more than any other opponent (223 times to date) … The Bulldogs return all five players from last year’s top power-play unit, which finished the season ranked fourth in the nation in efficiency (23.4%) … Sophomore goaltender Matt McNeely was unbeaten in four of five starts to finish the 2012-13 season (2-1-2) … The UMD freshmen burst onto the scene in the exhibition game, scoring four times and combining for nine points against Lakehead University.